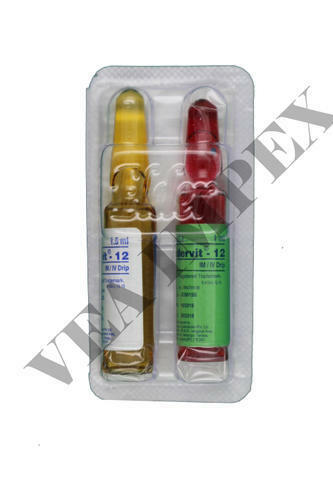 Eldervit Injection is used for Immunity, Riboflavin deficiency, Migraine, Thiamine deficiency, Eye disorders, Eye disorder, Neurological disorders, Neurologic disorders and other conditions. Eldervit Injection may also be used for purposes not listed in this medication guide. Eldervit Injection contains Vitamin B as an active ingredient. Eldervit Injection works by activating vitamin B6 and converting tryptophan to vitamin B3. Elder Pharamaceuticals manufactures Eldervit Injection. The following is a list of possible side-effects that may occur from all constituting ingredients of Eldervit Injection. This is not a comprehensive list. These side-effects are possible, but do not always occur. Some of the side-effects may be rare but serious. Consult your doctor if you observe any of the following side-effects, especially if they do not go away. Before using Eldervit Injection, inform your doctor about your current list of medications, over the counter products (e.g. vitamins, herbal supplements, etc. ), allergies, pre-existing diseases, and current health conditions (e.g. pregnancy, upcoming surgery, etc.). Some health conditions may make you more susceptible to the side-effects of the drug. Take as directed by your doctor or follow the direction printed on the product insert. Dosage is based on your condition. Tell your doctor if your condition persists or worsens. Important counseling points are listed below. Incepted in the year 2014, Vea Impex is an eminent entity indulged in trading and exporting a huge compilation of Pharma Tablets and Capsules. Along with this, these are tested on a set of norms prior final delivery of the order. We also provide the Pharmacy Drop shipping Service to our client.